Let me refresh your memory about my neighbour, Mrs W. She and I have become good friends in the last couple of years and I've made a few cards for her to give to people, including a 90th birthday card for Mrs M. Mrs. W's daughter is married to Mrs. M's son, but we'll come back to that later. Fast forward to yesterday, again at the hairdresser, where Mrs M reminded Mrs W that this week is the 40th (ruby) wedding anniversary of their married children. You guessed it! I now have two commissions to make two cards for the same couple - one from each of the mothers. So tomorrow afternoon, I'll be trying to figure out how to manage this whole thing - two different cards, both good, but the one for Mrs W will have to be just a smidge better, to keep this tricky relationship in balance! Wish me luck! I have no doubt that you can do it, Ardyth! But what stress when 2 friendships hang in the balance! This is a fantastic card by the way! Love the sparkle that speaks of diamonds! Gorgeous card. Lol...good luck with that smidge! This is just beautiful and I am really looking forward to seeing what you come up with for the 40th anniversary. Can it get better thanks this... cause this one is awesome... I'm watching and waiting! Stunning card, the die cuts are pristine, love the sparkle. I'm sure you'll manage the card balance perfectly, you make such fabby cards. Whatever you do, I'm sure the ladies will love them. After all, when have you ever made a bad card. This glittery gem is proof positive. I think this card is so elegant with some sparkle too! Only appropriate for a diamond anniversary. Have fun with the Ruby cards - looking forward to seeing them both! No need to worry, Ardyth - both your cards will be stunning beyond what either of the ladies can possibly anticipate! They'll be blown away with what you'll present to them! This anniversary card: stunning!! Isn't it wonderful that we can create cards to 'fill in' gaps, and in so doing, make people feel every so special? You're doing exactly that to the nth degree! Oh how funny! You'll just have to make them very different, right, then they won't be able to tell which one is "better." Well actually, what am I talking about, they will both be stunning I'm sure! Love those PTI number dies. They get so much use over here. What a fun story, Ardyth! 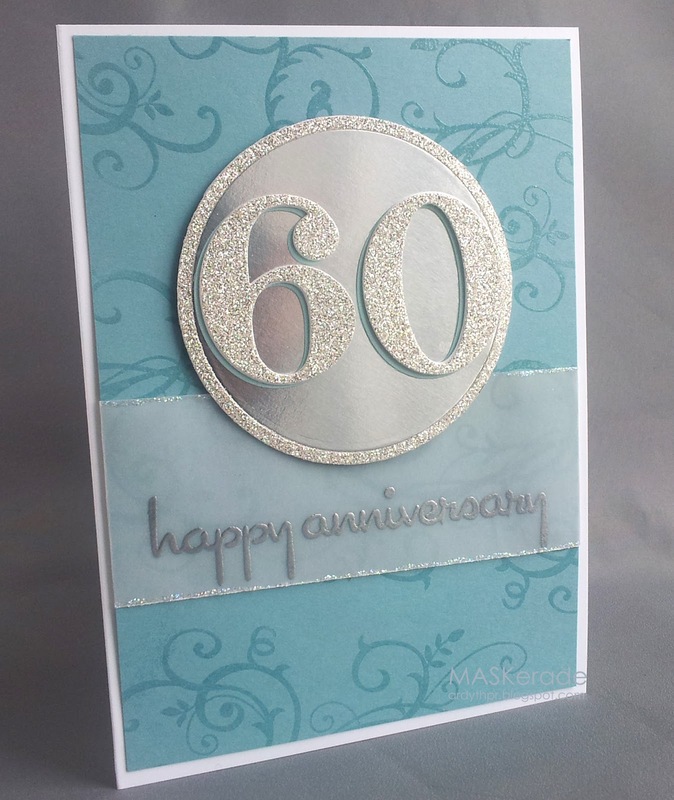 This is just perfect for a diamond anniversary...gorgeous card! Sorry to hear about your snow...like you, we've had more than enough...come on spring! What a gorgeous diamond Anniversary card Ardyth! I know you will work wonders for Mrs M and Mrs W! You cards are always lovely!